Reza Shah Pahlavi, founder of the Pahlavi dynasty. CONSTRUCTION WORKERS IN Iran may have unearthed the mummified remains of Reza Shah Pahlavi, the father of the country’s last monarch, nearly four decades after the Islamic Revolution toppled the dynasty. The recent find of the gauze-wrapped body has triggered intense speculation and revived discussion of Iran’s dynastic past, which the clerically-run government has spent decades trying to suppress. A mob demolished Reza Shah’s tomb shortly after the 1979 revolution, and the family lives in exile. The monarchy’s widespread abuses did much to fuel the revolution, but its mystique persists as Iran grapples with economic woes and calls for reform ahead of the 40th anniversary of the uprising. 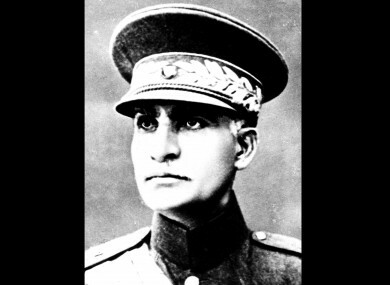 Reza Shah’s grandson, the US-based exiled Crown Prince Reza Pahlavi, has tweeted that he believes the remains to be those of his grandfather even as Iran waits for forensic experts to determine whose body they found. Workers discovered the mummified remains while on a project at the Shiite shrine of Abdul Azim, whose minarets rise behind the site where Reza Shah’s mausoleum once stood. A digger pulling away dirt and debris uncovered the body, according to the semi-official ISNA news agency. A spokesman for the shrine dismissed the idea of a mummy being found there. However, Hassan Khalilabadi, the head of Tehran City Council’s cultural heritage and tourism committee, was quoted by the state-run IRNA news agency as saying it’s “possible” the mummy is the body of Reza Shah. Authorities say they’ll need to conduct DNA tests to confirm whose body it is. State media typically refer to the Persian dynasties, including the Pahlavis, as “despotic,” focusing on the abuses of the monarchs’ feared SAVAK intelligence agency and their lavish lifestyles. Reza Shah’s own rise gave birth to modern Iran, which was still called Persia until he ordered foreign diplomats to cease using the name. He came to power in 1925, ruling as an absolute autocrat who used taxes and the country’s burgeoning oil revenues to rapidly modernise the nation. His decisions echo today, particularly his 1936 decree banning women from wearing long, flowing black robes known as chadors. He ordered men to wear Western clothes and bring their wives to public functions with their hair uncovered, borrowing from the secularisation of the Turkish leader Mustafa Kemal Ataturk, a contemporary. Iran’s strong trade ties with Germany, Reza Shah’s push for neutrality in World War II and Western fears over its oil supplies falling to the Nazis ultimately sparked a Russian-British invasion of the country in 1941. Reza Shah abdicated in favour of his son, Mohammad Reza Pahlavi, at the insistence of the occupying British forces. Khalkhali later would write in his memoirs that he believed the shah’s family took Reza Shah’s body when they fled the country. The shah’s family, however, maintained the body remained in Iran. His son Mohammad Reza Pahlavi was buried in Cairo after dying of cancer in 1980. Today, Iran’s youth remain fascinated by the time before the revolution. Television period pieces have focused on the Pahlavi dynasty, including the recent state TV series The Enigma of the Shah, the most expensive series ever produced to air in the country. While incorporating romances or mobsters into the tales, all shows uniformly criticise the royal court. Reza Shah’s grandson, Reza Pahlavi, has seen his profile rise following the election of President Donald Trump, who appears to hold the future of the Iran nuclear deal in the balance. From exile, the crown prince has agitated for an end to Iran’s theocracy. Gauging national sentiment about restoring the monarchy remains impossible. Email “Unearthed mummified remains could be those of the father of the last Shah of Iran”. Feedback on “Unearthed mummified remains could be those of the father of the last Shah of Iran”.